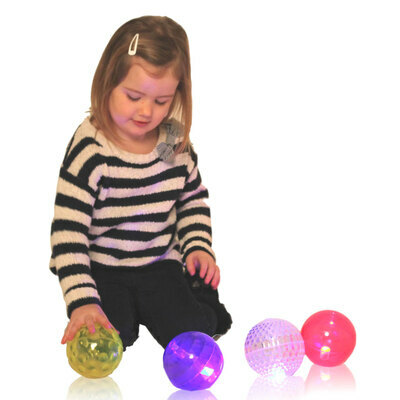 Suitable for all ages, these Sensory Flashing Balls are on hand to increase your sensory collection. Each one has been made from a lightweight and durable material that sits comfortably in children's hands. Simply roll these balls out on to your play area and allow children to explore their bobbled surface and varied textures. For additional excitement, encourage your class to throw and catch the ball. Watch on as each ball lights up and flashes as they make contact with floors or walls while the excitement levels of your entire class continue to rise. Each of the four flashing balls has been finished with a different texture for your students to explore. Here at Gompels, we have a wide range of Sensory Toys to help with your classes development. With everything from our Sensory Blocks 16 Pk and our Sensory Circles Assorted 10 Pack through to our Sensory Mood Light Table and our Sensory Mood Ball all at economical prices.